If you’re the sort of person who has to dust inside the liquor cabinet, you’ve probably wondered, “can alcohol go bad?“. If you have certain seasonal drinks, or save your top-shelf options for special occasions, you’ve also probably wondered alcohol does go bad. Distilled spirits (vodka, rum, whisky, tequila, etc.) will not go bad in a sealed, unopened bottle. Without oxygen interacting with the liquor, the contents will remain virtually indistinguishable from the time it was bottled, even over a period of years or decades. The shelf life is indefinite. However, once a bottle of liquor is opened, the oxygen will interact slowly over time so that it may eventually lose its flavor or become weaker as some of the alcohol evaporates. 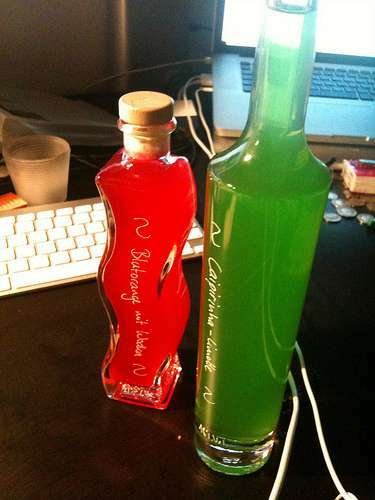 To minimize this effect, keep liquor in the tightest, smallest sized bottle that you have. If you only have 1/4 of a large bottle left, consider pouring the contents into a smaller bottle to minimize the surface area exposed to oxygen. Does alcohol go bad after opening? In case of distilled spirits the answer is negative, but they deteriorate because of the interaction with oxygen. Liqueurs and cordials will eventually go bad. The length of a liqueurs’ shelf life can vary widely depending on its characteristics. Dairy-based products like Kahlua or Bailey’s Irish Cream have the shortest shelf lives (12-18 months on average) and usually state a date on the label. These will spoil even if unopened, and should be consumed within a year of opening. So, if you’ve wondered “does alcohol expire?” – liqueurs and cordials definitely do expire. How long do liqueurs and cordials last? Sugar-based liqueurs will normally last at least a year, some even for several years, but will eventually go bad. Curdling, discoloration or crystalized sugar (usually visible from the bottom of the bottle) are physical indicators that a liqueur has gone bad. If a bottle has been open for some time, but shows no physical sign of going bad, taste test the contents before mixing with other ingredients. There are three different types of beer and therefore three different answers to whether beer can go bad. Vintage beers are designed to be stored for long periods of time. These are most popular overseas with ales and stouts that have a higher alcohol content and are designed to be stored for years in cool, dry locations. Unpasteurized beers, mainly originating from small locally-based microbrews, are the only kind of beers that can spoil in the traditional sense (like spoiled milk or rotten vegetables). Responsible producers of these products should put that information on the packaging. If you notice a foul odor or growing mold inside the bottle, throw it away. Mainstream, bottled or canned beer doesn’t spoil in the traditional sense, although it may become unpleasant to drink if it gets old or is not properly stored. Mainstream beer is kept in an airtight can or bottle and has been pasteurized, so will not spoil. Decomposition of ingredients is a factor though, and can cause “skunking”, or a change in the beer’s taste or odor. It will not harm you to drink this beer, but it might be very unpleasant and can taste flat or stale. Most mainstream beers now come with a “best by” date indicating when decomposition begins with properly stored beer. Temperature change, such as buying cold beer and storing it warm before re-cooling it, will accelerate this process. Bottled beers should avoid long periods of time in direct sunlight. Most bottles are brown to help cut down on the sunlight impact. Beer should be stored in a dark, cold location such as a cellar or refrigerator. If stored this way, beer will typically stay fresh for 6-12 months. Storing beer at a warm temperature will accelerate the “skunking” effect. Can alcohol go bad? As you should know by now, it depends on the kind of alcohol you’re talking about.Distilled spirits, if stored properly, have an indefinite shelf life. So, if you’ve wondered how long does alcohol last, it all depends.